after we got back from new york city last weekend caleb and i, very seriously, discussed how we had to re-create the nuts 4 nuts we couldn't stop consuming from the street vendors. we had to, there really was no other choice. google gave us hundreds of options for the seemingly simple recipe. people were getting a little heated on these sites. 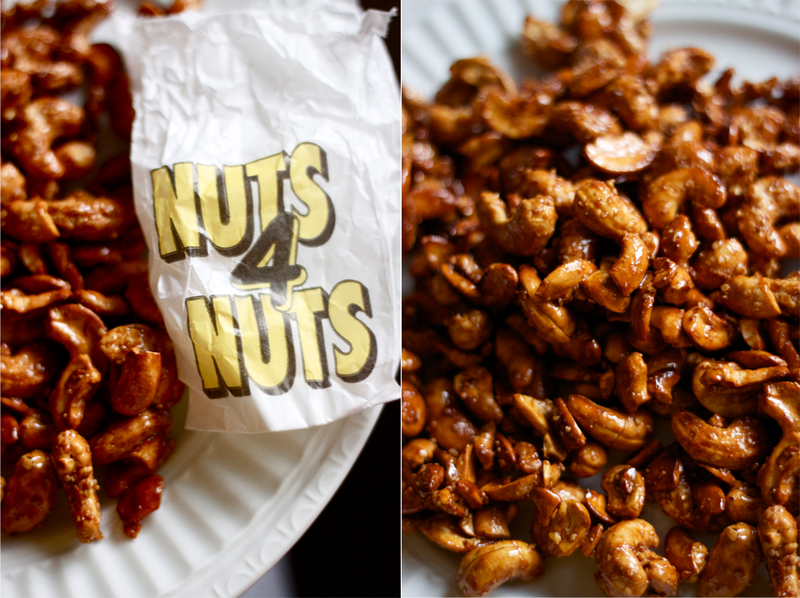 nuts 4 nuts is not original! my great grandmom has been making these since 1870! 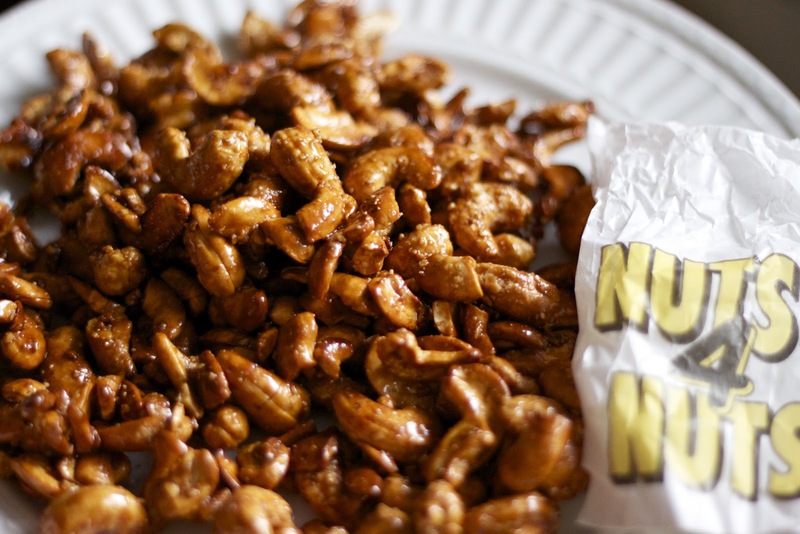 these are just candied nuts. and so on and so forth. so, if this is old news for you: carry on, carry on. clickety click. but if this is new news (?) for you, i will use one just word: AMAZEBALLZ. pardon my tenth grade french. we basically followed this recipe. except we had to stir much longer than stated. bring water and sugar to boil in medium saucepan over medium heat. once the sugar has dissolved, add in the nuts. stir occasionally. after about 2-2 1/2 minutes, stir fast. soon the water will evaporate and the sugar will stick to the nuts. keep stirring (arm work out!) until the sugar crystalizes. it will start to darken and look golden like in these pictures. once it looks like this, turn the heat off. set on a tray or plate to cool. the longer they sit the crunchier they are. although, they are pretty darn good fresh and warm. just don't burn your tongue. we spent $10! on raw cashews, which only made two batches of this. i am sure peanuts are cheaper but i love me some cashews. where can i get raw nuts for cheap? yes, i am cheap. in new york they also do this with chunks of coconut, if you want to make me some and send them my way i won't be mad at you. email me for my address. add some cinnamon or vanilla if you want to spice things up. and, trust me, you want to spice things up. ok. make some now, thank me later. When we were in NYC we had these same nuts. I about died. I could eat a bag for breakfast, lunch and dinner. And second dinner. Oooo...those look so good! I have a bag of almonds in my fridge. They might just need to have a spin in some sugar on the stove. Wow that looks great.. I was thinking about Perfect Nut Gift Baskets. Thanks for sharing. Keep exploring. During the winter nights there is awesome way to enjoy the dry fruits. The superiorpapers essay writing service is an amazing source to enjoy such reading. نقوم على نقل الأثاث من البيوت إلى مستودعات ومستودعات آمنة إلى حين ننتهي من عملية النقل أو حتّى تاخذها، علماً بأن المستودعات شاغرة من الحشرات والأتربة واي موارد قد تضر بالأثاث المخصص بك.